Noah Fleiss and Max Ligosh wear optical white high top and black low cut Converse “Chuck Taylor” All Stars in the film. Mike, Joe, and Ray reflect on their life in a small upstate New York town. Joe the King is Frank Whaley’s semi-autobiographical coming of age story about the struggles of Joe Henry (Noah Fleiss), a 14-year-old working class kid growing up in a working class New York town in the 1970s. The film begins with a school incident five years earlier in which his elementary school class has been asked to give reports about their father’s occupations for a Career Day assignment. Embarrassed that his father is the school janitor, Joe makes up lie after lie about his father’s occupation until a know-it-all classmate tells everyone that Joe’s father is the guy who “cleans our toilets.” Joe’s lying so angers the teacher that she hauls him up in front of the class, pulls down his pants, and spanks his bare bottom after he flicks a pencil at the classmate. And typical of the daily humiliation of his life, his alcoholic father, Bob (Val Kilmer), also chews him out when he hears about the incident, fearful of his job at the school instead of acknowledging that his son tried to stick up for him. While his mother, Theresa (Karen Young), older brother, Mike (Max Ligosh), and friends in the neighborhood are more sympathetic, as the story progresses we see that they too are unable to provide him with much emotional support. Joe would like to hang with Mike and socialize with girls like Mike is starting to do, but usually he is rebuffed by Mike in these efforts. In a pivotal early scene at a local skating rink, Joe is ignored by Mike and some nicer girls, but persisting, he finally gets up the courage to talk to a more promiscuous girl who at first resists, but then wants to dance. Joe’s attempts at dancing are so overdone that his friends laughingly describe it as someone shaking a puppet on a string. When the girl then grabs him and gives him a kiss, Joe is so flustered that he runs away. Joe turns to petty theft to compensate for his frustrations in life. Joe’s home life is miserable as well. Bob and Theresa do not have a happy marriage. Bob is an abusive drunken deadbeat who owes money all over town. He often takes out his frustrations by beating Joe or Teresa, and one night in a senseless rage, he destroys her collection of Johnny Ray records. As a result, Joe tries to avoid his father, especially when someone Bob owes money to asks Joe to remind his father to pay it back. Theresa seems withdrawn from the family and is especially neglectful of Joe. Their house is usually a mess, Joe is hungry much of the time, and seldom has clean clothes. Some of the girls in town think he looks like a hobo, and this image is reinforced by his wearing a canvas tote bag around town where he stores small items he is constantly stealing or shoplifting. His dysfunctional family life, lack of parental guidance, and the constant humiliations he faces seems to be the key to Joe’s escalating anti-social behavior, which besides the petty theft, includes constant tardiness at school and difficulty developing any kind of trusting relationships with others. Yet underneath Joe’s sullen and defensive attitude that seems to invite further rebuffs from the outside world, you get glimpses of a thoughtful and gentle side. He has musical talent, can read and speak intelligently when he chooses to, and maintains a private hideout under the porch at home where he keeps his treasures. Even though he is underage, Joe works as a busboy at a local diner to earn some money which he hopes will gain him some respect in town. At the diner, Joe is treated poorly by the family who owns it, but there he also gains an unlikely ally, Jorge (John Leguizamo), another worker who sticks up for Joe and treats him like a friend. And despite the neglectful and abusive treatment by his parents, Joe is determined to try and make things right at home by replacing Theresa’s record collection and helping to pay off some of Bob’s debts. Unfortunately the only way Joe can accomplish these goals is by stealing the money required to make them happen. When he finds out that the restaurant owners have gone out of town for a day, he breaks into their apartment above the restaurant to steal the cash box he knows must be there. But after breaking in, Joe’s frustration and resentment over his treatment overwhelm him, and he smashes a wall mirror, severely cutting his leg. Typical of Joe’s luck, the leg becomes infected, and when Joe’s high school counselor Len Coles (Ethan Hawke) discovers this, he immediately takes Joe to a doctor for treatment and starts investigating the cause of the injury. When Coles contacts the restaurant owners about the injury and the fact that Joe was an underage worker, they figure out that Joe must have been responsible for the break-in and contact the police. Things come to a climax when Joe is arrested by the police and sentenced to a term in a juvenile facility. Counselor Len Coles tries to persuade Joe to improve his performance at school. After seeing Joe the King, one is reminded of a classic line from the Paul Newman film Cool Hand Luke: “What we have here is a failure to communicate.” It is not until Joe is about to be taken away to the juvenile facility that his family realizes how they have let him down, and attempt to express their love for him. You realize that if Joe had received some of this support earlier, things might have turned out differently. Up to this point, his life has been so depressing that his incarceration seems more like a step up than punishment for his stealing, because the police and juvenile authorities are not abusive in their treatment of him like his family and school officials were. The generally sad and pitiful tone of the film makes you think that Joe could be a twentieth century version of a character in a Dickens novel. You could easily image Joe uttering Oliver Twist’s classic line “Please, sir, could I have some more?” There are similarities as well to Francois Truffaut’s 1959 film The 400 Blows and to some of the early scenes in Sleepers. Writer/Director Frank Whaley received a screen writing award at the 1999 Sundance Film Festival for Joe the King, and the characters in the film leave some vivid impressions. Noah Fleiss is excellent in the title role; you can really see the hurt in his eyes even though you seldom see beneath the protective shell he projects to fend off the mistreatment that pervades his life. Val Kilmer’s performance is a total surprise — he took a real chance in his portrayal of Joe’s low life, abusive alcoholic father, complete with beer belly. There is realism in John Leguizamo’s performance as the cynical restaurant worker, Karen Young’s lack of energy as Joe’s beaten-down mother, and Ethan Hawke’s depiction of the unsympathetic guidance counselor. Joe the King provides a bleakly pessimistic look at the underbelly of our society. While some may criticize incidents of the story as too unrealistic or self-pitying, the characters ring true, reminding us that not every look back at our recent past will consist of pop music medleys, remembrances of good times, and unforgettable friendships. Joe walks across his mom’s broken record collection, destroyed by his father in a drunken rage. Joe is taken to a doctor to treat the infected cut on his leg. 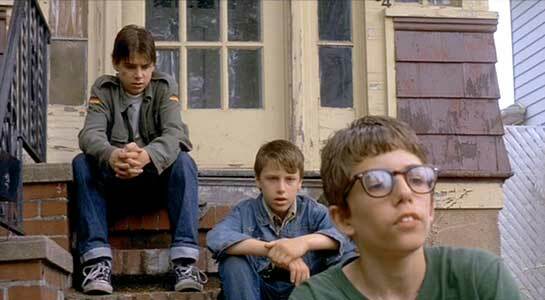 Joe wears well-worn white hightop chucks throughout the film, and his older brother Mike wears black low cuts. Joe’s chucks are even mentioned a couple of times in the story line. When his father asks him, “Why don’t you throw those shoes in the trash?” Joe replies, “Why don’t you buy me a new pair?” Later when Joe is about to begin his term at the juvenile facility, his father, trying to make small talk, asks him again, “When are you going to get rid of those shoes?” Joe answers, “I’ll get around to it some day.” But Joe isn’t about to give up his chucks; they are an essential part of his preferred personal dress of denim jacket, jeans, and white tank top. Joe’s identity with his chucks is captured by the cinemaphotography in several places. 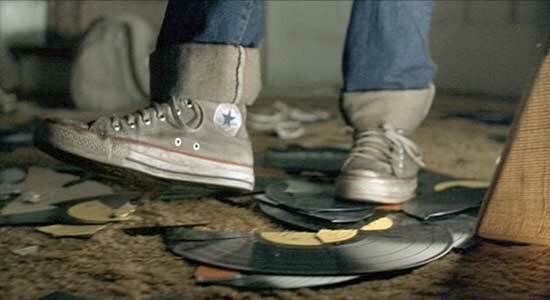 One significant scene is when he discovers his mom’s destroyed record collection, and you see a long closeup of his chucks tiptoeing across the plastic shards; another is in the doctor’s office after his infected leg wound has been treated, and you see him concentrating on carefully lacing one up while trying to fend off prying questions from the doctor. Joe laces up his chucks after seeing the doctor. Joe the King. (1999) Noah Fleiss, Karen Young, Caryn Mannheim, Max Ligosh, Austin Pendleton, John Leguizamo, Ethan Hawke, Val Kilmer. Directed by Frank Whaley. Categories: Drama, Coming of Age.